The field of crystal engineering concerns the design and synthesis of molecular crystals with desired properties. This requires an in-depth understanding of the intermolecular interactions within crystal structures. This new book brings together the latest information and theories about intermolecular bonding, providing an introductory text for graduates. The book is divided into three parts. The first part covers the nature, physical meaning and methods for identification and analysis of intermolecular bonds. The second part explains the different types of bond known to occur in molecular crystals, with each chapter written by a specialist in that specific bond type. The final part discusses the cooperativity effects of different bond types present in one solid. 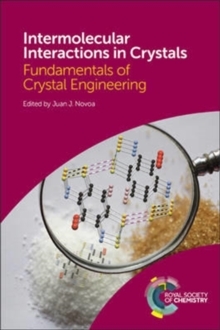 This comprehensive textbook will provide a valuable resource for all students and researchers in the field of crystallography, materials science and supramolecular chemistry.